18 cm vii, 325 p.
Reprint. Originally published: London: Secker & Warburg, 1949. Cover title: 1984. Renowned urban artist Shepard Fairey's new look for Orwell's classic dystopian taleOne of Britain's most popular novels, George Orwell's Nineteen Eighty-Four is set in a society terrorised by a totalitarian ideology propagated by The Party. Despite the police helicopters that hover and circle overhead, Winston and Julia begin to question the Party; they are drawn towards conspiracy. Yet Big Brother will not tolerate dissent - even in the mind. For those with original thoughts they invented Room 101. . . Nineteen Eighty-Four is George Orwell's terrifying vision of a totalitarian future in which everything and everyone is slave to a tyrannical regime. 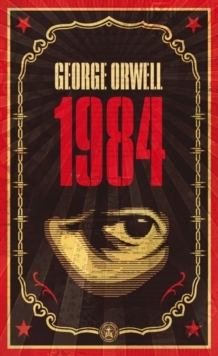 The novel also coined many new words and phrases which regular appear in popular culture, such as 'Big Brother', 'thoughtcrime', 'doublethink' and 'Newspeak'.